Katie and Mike Brandt celebrated Noah’s third birthday and Mike’s 32d birthday in March 2011. Katie and Mike Brandt met as freshmen at Saint Anselm College in Manchester, N.H., and married shortly after graduation. 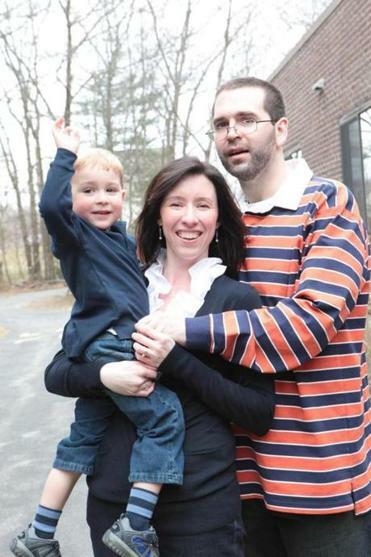 Mike taught high school theology while Katie worked for the New Hampshire Division for Children, Youth, and Families. Worse, his personality was changing. When baby Noah was born, Mike didn’t want to spend time with him, or his wife, choosing instead to watch TV and listen to Harry Potter audiobooks obsessively. He became withdrawn. He bought things they couldn’t afford and would walk for miles in the middle of the night. Friends and colleagues wondered about him. It would take months — and eight misdiagnoses — before the verdict was in. Her husband had frontotemporal degeneration (FTD), a neurodegenerative disease that results in dementia and death. It affects personality, behavior, and language. There is no treatment or cure. Dr. Bradford Dickerson is director of the FTD unit at Massachusetts General Hospital and a leading researcher on the disease, which affects an estimated 50,000 to 300,000 people in this country. Firm numbers are difficult, since it is so often misdiagnosed. Dickerson was Mike Brandt’s doctor. In some patients, FTD at its start affects mostly communication. “In others, like Katie’s husband, it’s emotional and social behavior,” Dickerson says. On average, it strikes people between ages 45 and 65, “the prime of their life,” according to Dickerson. Brandt was 29 when he was diagnosed. Just days after he was diagnosed, Katie’s mother died of a heart attack at age 58. Two weeks later, Katie’s father was diagnosed with early onset Alzheimer’s at age 59. She was left with an ill father and husband, and a toddler. She left her job and home in New Hampshire, and she and Noah moved in with her father in West Bridgewater, where she had grown up. It was an impossible task. Doctors told her Mike had to be moved, and for the last two years of his life he lived at a neuro rehab center in Middleborough. Through MGH, Katie was connected to an FTD support group, which she now co-leads. “FTD was just running over my life and there was absolutely nothing I could do about it,” she says. With Dickerson’s help, Mike was enrolled in a research group, and when he died his wife donated his brain to research. That was just the start of her taking back power from the killer that had invaded their lives. In addition to leading the support group, Katie Brandt is the New England volunteer coordinator for the Association for Frontotemporal Degeneration, the only nonprofit in the United States devoted to the disease. Each year, there’s an annual caregiver conference, where loved ones come together to help one another. Brandt gives speeches at hospitals and colleges, on Beacon Hill and Capitol Hill, to share her family’s story and to raise funds and awareness for FTD. The Brandts lost some friends because of Mike’s illness, which hurt. “People just did not know what to do with us. We were a sad and scary story,” she says. But there were others — old and new friends — who helped the family through unimaginable times. Feb. 28 is International Rare Diseases Day, and on Monday, speakers from the rare disease community will be at the State House at 11 a.m. to talk about their causes. Katie Brandt will be at the AFTD table. She’s 35 now, and Noah is going on 7. Her father is doing well, in a stable routine in his own home, with her and Noah. It’s a lot of work, being a single mom and a caregiver for her father. Still, she has been on a campaign (katiebrandt.org) to get on “The Ellen DeGeneres Show,” “not to become a reality TV star,” but to spread awareness. “Eight misdiagnoses. No available treatment to stop the progression. A terminal outcome. This is a conversation that has to change,” she says.